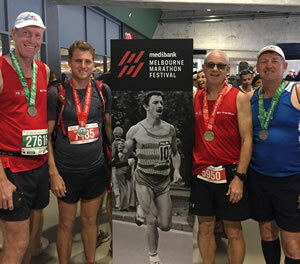 Whilst the Mackay Road Runners had a rest weekend from racing, over twenty Mackay Road Runners registered a strong contingent of talented runners at Australia’s largest marathon event, the 41st Medibank Melbourne Marathon at the weekend. Among nearly thirty-five thousand competitors across all events, excellent results in the Marathon saw Carl Pinkstone clock an impressive 2 hours 57 minutes (20th in his age) in the testing 42.2km event with injury ridden Julian Picot scoring well to place seventh in his age in three hours and eight minutes. Melbourne is a favourite racing destination for many locals, including Martin Lambert (3hrs 45min), Jose Short (3hrs 47 min), Jenny Harmer (4hrs 34min) and June Bradley (4hrs 15min). Congratulations to first time marathoners, Bronwyn Overall and Erin Crowley who ran in sync supporting each other the entire distance to cross the line in five hours and three minutes. Excellent results were also posted by half marathon runners, Matt Stevens, Tim Magoffin, Natasja Steenkamp, Robyn Devantier and Vicki Connole. Glynis Forse had an outstanding and beautiful experience in the Marathon as she pushed a paraplegic in a wheelchair so that they could both enjoy the spoils of racing 42.2km. The marathon effort was a very emotional and uplifting time for both athletes as they traversed the course together in six hours twenty-seven minutes…congratulations! Meanwhile locally, Mackay Road Runners are gearing up for their prestigious annual Awards evening to be held this Saturday night at the Mackay Surf Club. All runners, their families and supporters are looking forward to celebrating a very special year with like-minded individuals. The year has brought forward many new challenges for all runners, new and old, with the introduction of many new faces and sadly, the departure of some. The Presentation night will commence with Junior Club Championship awards to Mackay’s talented runners before proceeding to the presentation of the senior accolades. Many thanks to Club Patron, Col Meng, who will be in attendance to present trophies including the Col & Rhonda Meng Club Person of the Year. 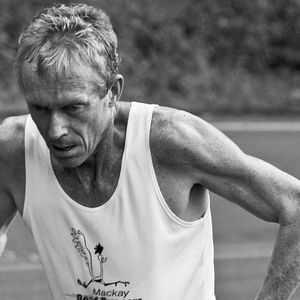 Mackay Road Runners will continue to run off season in a bid to retain fitness through the silly season, therefore, as usual, Club Captain, Jim Ford has set a very social Shawn’s Summer Series of unique running concepts and events. Shawn’s Summer Series will commence this Sunday afternoon from the Lamberts Beach Tavern precincts. Jim is to be congratulated on his thoughtfully planned format which offers a variety of options for runners’ abilities at varying stages of their training. 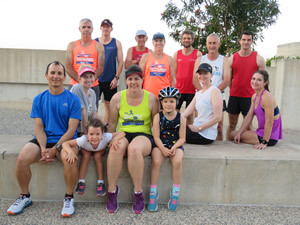 The very social run is planned for every Sunday afternoon until the 2019 season commences, with only a gold coin donation going towards post run fruit, etc. Additionally, for runners who enjoy a social Saturday and Thursday morning and/or Tuesday evening run, please check with the Club for exact locations and time.